Next of Kin: Eldest son of Frederick and Harriett Wareham of The Poplars, Somers Park Avenue. Previous Employment: Schoolmaster at St Matthews Boys School, Westminster, previously a student teacher at Somers Park Council School. 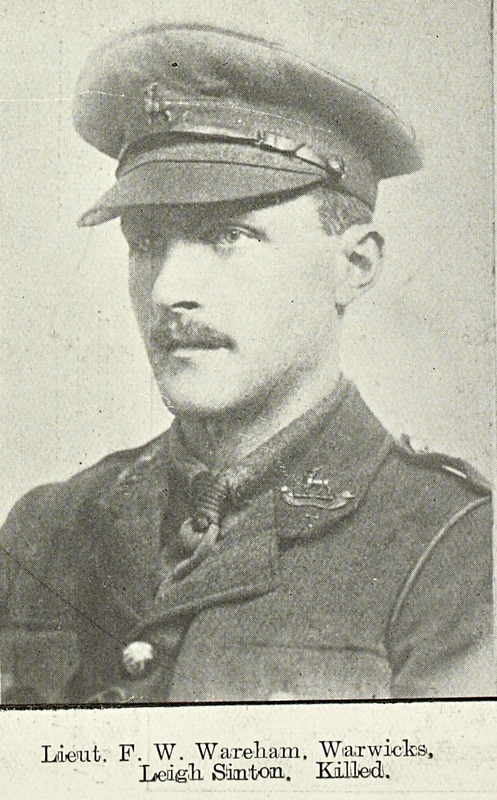 Frederick Wareham was the son of Mr Frederick Wareham, the headmaster Leigh Sinton School. He attended Malvern Link C.E. School and later Worcester Royal Grammar School. He began training as a teacher at Somers Park Council School, and from 1911 to 1912 went to Saltley Training College. By 1914 he was employed by London County Council at St Matthews Boys School, Westminster. When war broke out he joined the 1/12th London Regt (The Rangers) and was made a Corporal. During the first few months of the war, his battalion guarded the railway line from Waterloo to North Camp (near Aldershot), but in December they left the 3rd London Division and went to France, firstly as Lines of Communications troops and then to the 84th Infantry Brigade, 28th Division. Frederick Wareham was not in France for long however, in March he was wounded and was invalided back to England. “During this time he obtained a commission in the Royal Warwickshire Regiment in June 1915 and was promoted to Lieutenant in November 1915. He proceeded to the front in Easter week 1916 and joined the 1/8th Territorial Battalion, which was part of the 48th (South Midland) Division. He was killed on the first day of the Battle of the Somme. Frederick’s father, after whom he was named was for some time the headmaster at Leigh Sinton school.